This toolbox is for adjusting the buttons' properties. 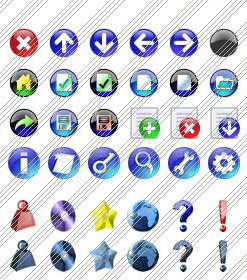 You can adjust one single button or a group of web page buttons selected with Ctrl/Shift keys at once. Text - type the button text here. If you want the button to have several lines of text just press "Enter" after typing each line. Text alignment - defines text alignment inside the button. Text offset - text offset in relative coordinates. For more precise text position adjustment. Link - the link that is to be opened when user clicks the button. 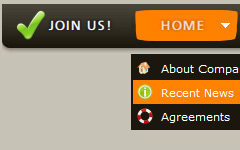 For example: http://www.vista-buttons.com. You can also click "Open" icon to the left of the "Link" field to select the page you want to link to. Hint - specifies the tooltip that is shown when you hold the mouse over the button for a few seconds. 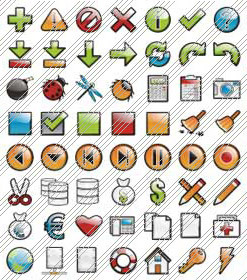 Autosize - defines whether the button size is set automatically to accommodate all its contents or not. 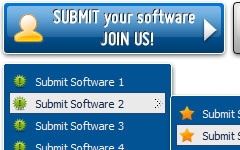 If not, you should enter the button size manually in the "Width" and "Height" fields. Width, Height - if "Autosize" property is off then you can enter the button size in these fields. Pressed - this property is disabled unless your menu type is "3-state toggle". 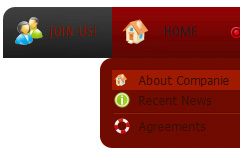 If the menu type is "3-state toggle" and the property is set then the button will be displayed as pressed. Note, that only one button in the menu can be "pressed" at a time. 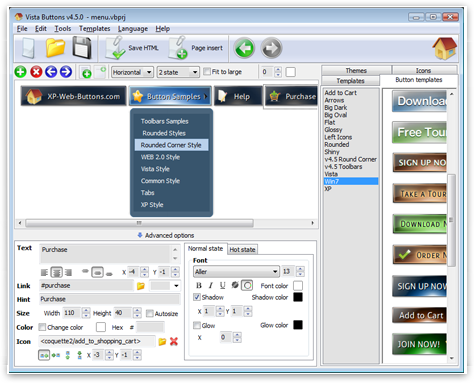 In the example below, the "Download" web page buttons Pressed property is set. Color - move slider to change selected buttons' colors. 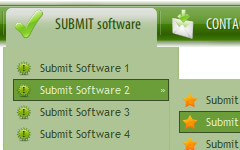 Double click on the one of the predefined buttons' and submenus templates to apply it to your menu When the submenu is larger than the visible area of the page the submenu will be automatically decreased. You can use scrollbar to see all submenu items Build menus completely based on Cascading Style Sheets. It is possible to appoint the individual CSS styles for separate elements of the menu.